It’s beetroot season which means you’ll see the little purple darlings turning up in your organic veg boxes in their droves. Many people are averse to beetroot having only experienced crinkle like slices steeped in overpowering vinegar which is a shame has fresh beetroot has much to commend it. We have turned to Israeli master of vegetables, Yotam Ottolenghi for a way to release the best beetroot has to offer. The aptly named candy beetroot is as sweet as candy and its flesh is made up of beautiful, alternating red and white rings. 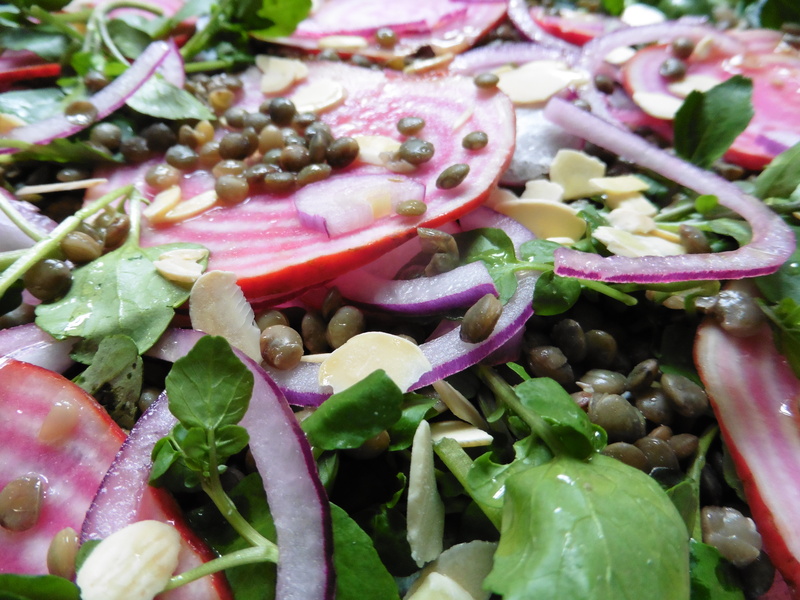 To take advantage of this, you can slice it thinly and use raw in salads – once cooked it turns a uniform mellow pink. If you can’t find it, use golden or normal red beet instead (or a ­combination of all three). Yuzu is a citrus fruit originating from east Asia. Its zest and juice are used to add a fresh aroma to various Japanese dishes, including soups. I’d describe the flavour as a combination of lime and mandarin. You can get the juice and powdered dried skin from Japanese specialists – try mountfuji.co.uk. If you are unable to get your hands on it, don’t worry – just use a bit of lime juice instead. Serves four. Put the beetroots in a large saucepan and cover with plenty of water. Bring to a boil, turn down the heat and cook on a gentle simmer for about an hour, adding boiling water as needed. To check that they are cooked, stick a knife into the largest beet: it should go in smoothly. Lift the beetroots from the water and leave to cool (they’ll keep in the fridge for a day or two). Peel and halve the beetroots, and cut into wedges 1cm thick at the base. Put the lentils in a small saucepan and cover with plenty of water. Bring to a boil, then lower the heat and simmer for 15-20 minutes, until al dente. Drain, transfer to a bowl and, while they’re still hot, stir in a tablespoon each of yuzu juice and olive oil. Season and set aside to cool (the lentils can now also be kept in the fridge for a couple of days). Yotam Ottolenghi is chef/patron of Ottolenghi. Download our free app at www.luxuryrestaurantguide.com to view the finest dining venues close to your location.